Full Disclosure: I did not like the 2014 version of the Penn State Nittany Lions. They were annoying. It always seemed like they could be doing better – you know, like the first four games of the year when they looked good. I was just upset that the team went 6-6 when it could have been 9-3 if just about three plays go differently. Yes, it was James Franklin’s first season and getting a new coach is a bigger deal than many would recognize, but after exciting teams for the past few years it was just annoying to be around .500. I really, really wanted that win over Ohio State. I’m greedy though, I want to win every game every year. even though I would publicly state “This is a year with a low bar, they need to adjust to Franklin,” I would still be upset unless they won the national title. However, this season brought about two supremely bright spots. First, the end of the bowl ban. I don’t want to go in depth to why the ban was wrong as now is not the time. It was wrong, but it also was. We can move past this point now as Penn State’s postseason eligibility has been restored. This day, which was a few months back, was one a long time coming. Today is when the overturn of the decision mattered. 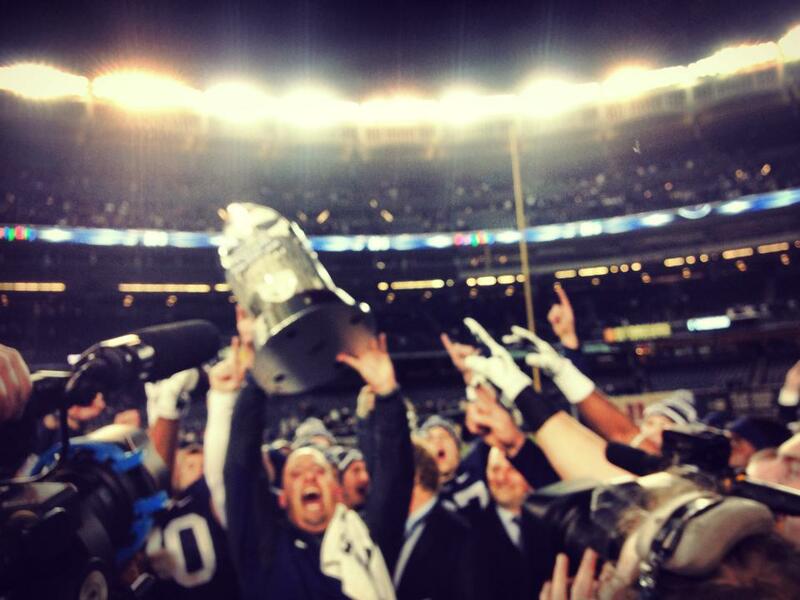 Penn State won their first bowl game in years, the Pinstripe Bowl, over Boston College in overtime 31-30. Second, winning a bowl game and beating BC is a reality too sweet to deny. The ending to the game brought a larger smile to my face than anything this season. Boston College missed an extra point in overtime. This is more commonly referred to as “the easiest possible kick in the sport.” Watching BC lose in heartbreaking fashion is just the best. But watching Penn State with a trophy is equally as wonderful. I’ve said this a lot to my friends both at Penn State and fans of the team: Once Franklin, a noted recruiting guru, can get his own class of students, as opposed to those of Bill O’Brien, the team will most likely improve. They aren’t the same style of coach – O’Brien was a New England Patriots offensive coordinator while Franklin was the head coach of Vanderbilt. This is like trying to make round pegs work in a square machine. Simple as that. Penn State will improve with time. It’s just disappointing that it wasn’t faster. Yes, this is borderline petty and admittedly greedy, but sue me, I felt the feelings I felt. The take away is this. BC lost, Penn State won, and things are looking up for the Lions. For the first time in a long while, there is reason to be elated in Happy Valley.